brainCloud support two varieties of S2S calls: with and without explicitely-allocated sessions. Note – the session-based S2S protocol, like the client protocol, supports the bundling of several API calls within a single HTTP request. In most circumstances it is more practical to combine the calls into a single cloud code script instead. Overall, the session-based S2S protocol is recommended for production applications, because it eliminates the redundant creation of disposable sessions. It performs better and costs you less! This tutorial will show you how to simulate both types of request via Postman. Incoming servers must be configured (i.e. declared) in the brainCloud dashboard before making S2S calls. This allows brainCloud to confirm that the requests are coming from a server that you own and aren’t malicious. Entering ip ranges restricts access to requests coming from the specified network addresses. This is highly recommended for production apps! For now though, you can leave the ranges blank. This will make all IP ranges acceptable. Hit [Save], and note your server secret – you will use it later. Session-less requests are simple. Each request is completely independent – no sessionIds or packetIds to manage. This API is best when the calls into brainCloud will be few and far between. Unless you have added some properties, you will see an empty JSON response. To change this, go to the Design | Custom Config | Global Properties page of the brainCloud Portal and configure a property or two – then run this request again. Voila! Session-based requests require you to first request a sessionId to use via the Authenticate operation. You then reference that sessionId in subsequent requests, along with an incrementing packetId. View the response, and save the sessionId that is returned. Always increment the packetId – except for identical retries. If you’re retrying the same request because of a communications failure, you should keep the packetId the same (it helps the server to prevent duplicate operations from happening). If you got a response from the server though, successful or not, you should increment the packetId for you next request. 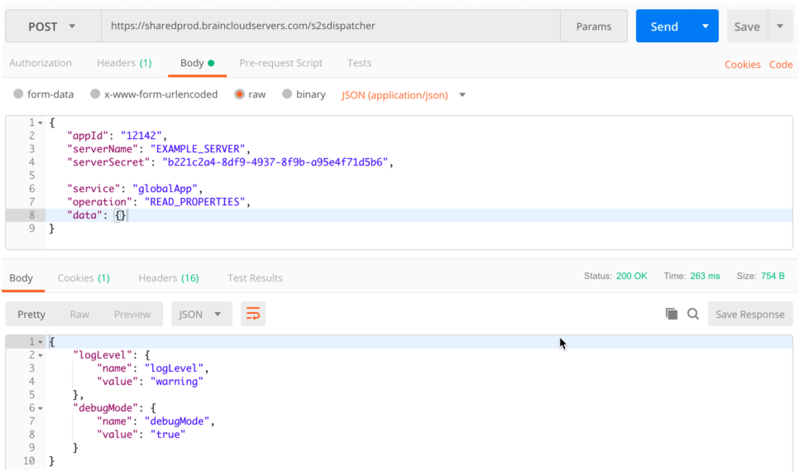 The API calls documented in the API Ref (http://getbraincloud.com/apidocs/apiref/?raw#s2s) are mapped to discrete Services and Operations on the server. The codes, together with operation-specific parameters (specified in the JSON data object) are used to send commands to the server. 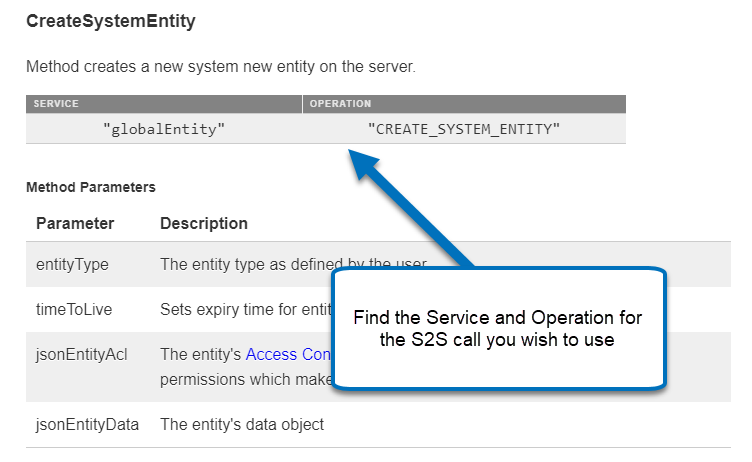 Only the API Calls in the S2S section of the API Ref can be used for S2S calls.